Disney and Square Enix team up together to bring you this San Diego Comic-Con 2017 exclusive 8 figure Domez set of your favorite Kingdom Hearts characters! With the recent launch of the new Kingdom Hearts video game, this set will definitely be one most sought after exclusive for all gamers at this year’s SDCC. Each Kingdom Hearts Domez mini figure comes packaged in its very own protective collectors dome perfect for display. 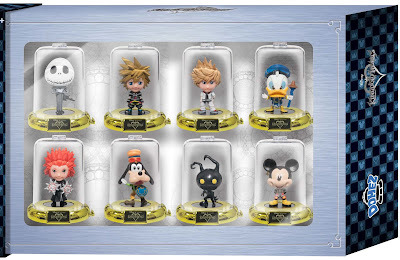 The 8 characters included in the San Diego Comic-Con 2017 exclusive Domez set are: Mickey, Goofy, Heartless, Jack Skellington, Donald, Sora, Roxas and Axel. Collectors can pick up the San Diego Comic-Con 2017 Exclusive Kingdom Hearts Domez Mini Figure Set at the UCC Distributing SDCC booth #5625 for $29.99.